I have reached mushroom nirvana! 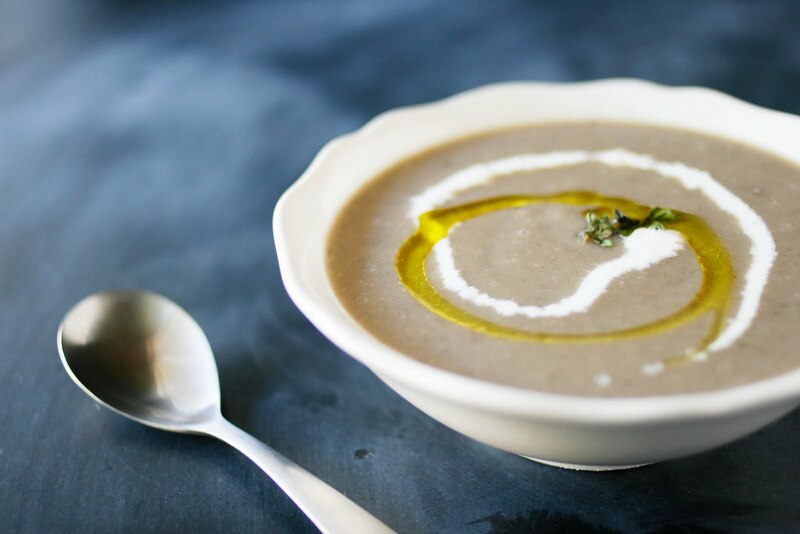 This soup is pure, unadulterated mushroom goodness and goodness is the perfect word to describe this soup. Since it's pureed, it's creamy as hell, yet, if you can believe it, has no cream, milk and only 2 tbsn. of olive oil! The addition of 1 single potato makes it thick and luxurious and it really is magical. 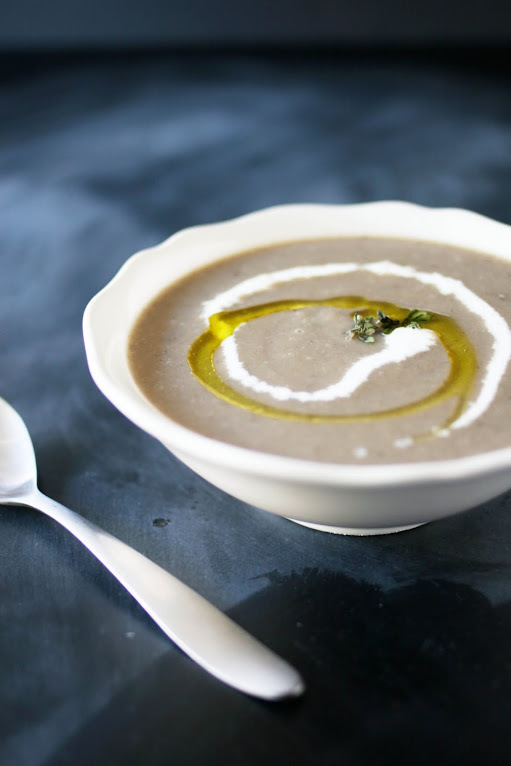 If you love mushrooms, this soup is for you. It's pure mushroom flavor and super easy to make. In a large pot, heat the oil over medium heat. Add the onion and garlic and season with salt. Cook, stirring occasionally, until softened, about 5 - 7 minutes. Add the mushrooms, potato, thyme, broth and enough water to cover, about 2 - 3 cups. Bring to a boil, reduce the heat to medium and simmer until the mushrooms and potatoes are tender, about 20 - 30 minutes. Using a blender or an immersion blender, puree the broth and veggies until smooth. If using a blender, work in batches and fill only halfway, allowing the heat to escape. Transfer to a clean pot as you work. Adjust the soup's consistency with a little water if needed, and season to taste with salt, pepper and lemon juice. Looks really nice and warming! def, going to try and make this tomorrow night, thanks! 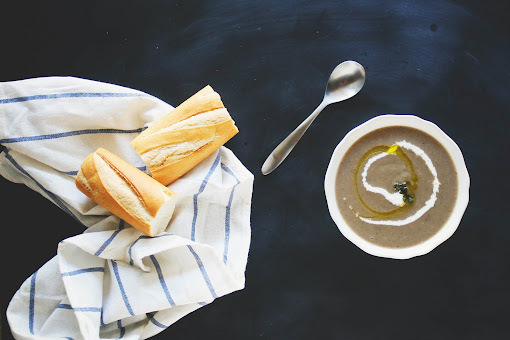 Hello, first time on your blog and I must say, just reading you puts a smile on my face and makes me want to spread this joy of cooking even more. I will definitely try this mushroom experience! Whoa, brilliant! I love mushroom soup but I don't think I've ever actually made it for myself! Pureeing is such a great idea to get the creamy texture without cream (not a favorite of mine). going to make this tomorrow night in celebration of my new stick blender which my dad bought me (he's an impulsive shopper!) and which I have no idea what to cook with! One question: in the UK stock doesn't come in cans so I just wanted to check, does this recipe call for 29oz chicken stock, plain and simples? Or is a can of chicken stock more complicated than that- in need or dilution or something? @ Rachel: this one is so simple it's crazy and the results are nothing short of amazing! @ Helen: ooooh i wish i had a stick blender! our chicken stock comes in 14 oz. cans (equivalent to 1 3/4 cups of stock). i like to use low sodium, then add more salt to the soup if needed. i don't think your stock should need dilution though - hope that helps! Gorgeous photography and styling, Michelle! I am so impressed that you made a light brown soup look so delicious. @ Cookie & Kate: thanks! it sure was a challenge - props props props! I agree with Cookie + Kate: brown food takes talent! Love you rich, saturated colors.